'Create Again', April 4, at the Arlene Francis Center, 99 Sixth St., Santa Rosa. 6pm. $15–$20. 707.528.3009. Tickets and donations at indiegogo.com. LOPEZ'S LEGACY A photo of Andy Lopez inspired a benefit concert for Cook Middle School's music program. Like many others, Darwin Meiners still struggles with the grief and anger following the 2013 shooting death of 13-year-old Andy Lopez at the hands of law enforcement in Santa Rosa. Meiners, a longtime Santa Rosa resident, musician, band manager and father of two, wanted to do something about it, but didn't know where to begin. That's when a picture of Lopez holding a trumpet ignited the idea for a benefit concert in his memory. Meiners' idea takes shape at the "Create Again" concert April 4 at the Arlene Francis Center. "I was upset on a number of levels, but I didn't know him, I wasn't dialed in with the community protesting," says Meiners. "Doing research, I saw a picture of Andy playing trumpet. I didn't know that he played music, but looking at that photo, the connection immediately clicked." Meiners learned that Lopez played in the band at Cook Middle School. The benefit raises funds the music program there. "It's a way to be positive and make it about creation, not death and anger," says Meiners. "That's all there still, you know? And it's going to be a heavy night, but everyone wants to see something good happen." The show boasts a lineup of local and not-so-local talent, such as Alex Maas, a member of Austin's psyche rockers the Black Angels. Sonoma County songwriter BC Fitzpatrick, Stanford shoegazers Silent Pictures, electronic indie project Survival Guide (aka Emily Whitehurst) and the ethereal Ashley Allred are all booked. Every artist eagerly offered support, as have a number of others who've donated to an online auction. The first person to donate was Jesse Michaels from Operation Ivy, who also coined the phrase "Create Again." Doug Martsch from Built to Spill, David Bazan, Tobin Sprout of Guided by Voices and many others have thrown in signed records and exclusive goodies. Local businesses are offering everything from skateboards to massage treatments to the auction, and Stanroy Music Center has donated a new trumpet to the cause. Loud & Clear has also donated a clarinet. Though Meiners is not personally in contact with the Lopez family, he is working with those close to the case to inform attorneys involved about the event. 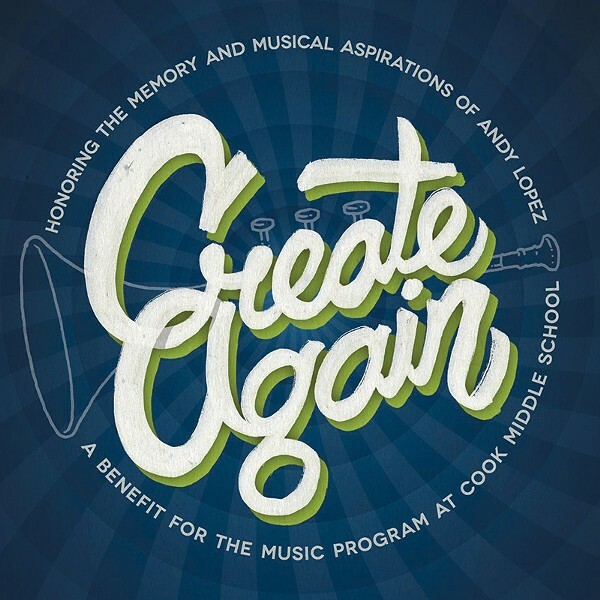 All proceeds from the online campaign and the concert will be donated in Lopez's name, and Meiners hopes to make this an annual tradition, benefiting a different school's music program every year and keeping the memory of Andy Lopez vibrant and alive.